Roxette are back! The first new album for 9 years has finally been released in the UK today. This album is awesome! Buy it here “Other” section. “Charm School” is already album of the week on BBC Radio 2, and “She’s Got Nothing On (but the Radio)” is improving its position on the UK airplay chart! They are also now on Apple Ping! Comments : Comments Off on Charm School! Amazing! Comments : Comments Off on ABBAWORLD Next Stop-Prague. The forthcoming Super Trouper Deluxe Edition is an exciting double disc package of a classic ABBA album, in the vein of previous Deluxe Editions of Arrival, ABBA – The Album and Voulez-Vous. the track listing has already been revealed for the CD and the DVD included in this package, the latter of which features previously unreleased television performances. Now some information on the work that has gone into the remastering of the original album. On Super Trouper Deluxe Edition, all tracks on the CD have been remastered especially for this release. All of the recordings used in this process have been taken from the original master tapes of each individual track on the original album. In other words, these tapes are as close to the original recording as they could possibly be, making for the pure, unadulterated sound of ABBA in the studio. The same is also true of the bonus tracks. The philosophy behind the CD mastering, made by Erik Broheden at Masters Of Audio in Stockholm, Sweden, was to remain as close to the original tapes as possible, retaining the original dynamics. Any enhancements have only been made to further bring out the sound as originally produced by ABBA’s Benny Andersson and Björn Ulvaeus in collaboration with their invaluable sound engineer Michael B. Tretow. 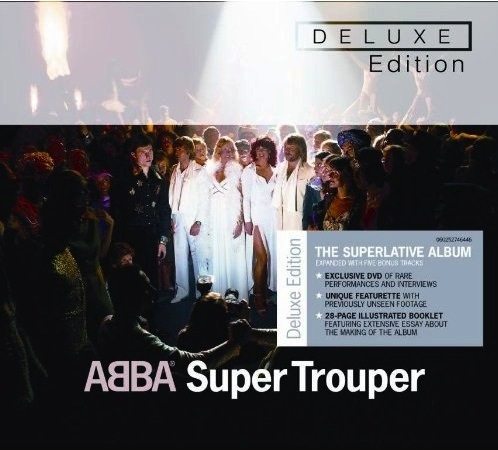 Super Trouper Deluxe Edition is released May 9, 2011. 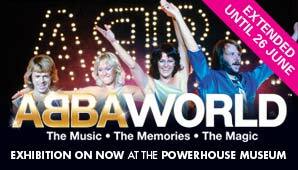 ABBAWORLD, the exhibition about the 70s global pop sensation ABBA whose music almost four decades on continues to attract a new generation of fans, has now been extended at the Powerhouse Museum until 26 June 2011. ABBAWORLD captures the music, memories and magic that made the Swedish group a worldwide phenomenon. 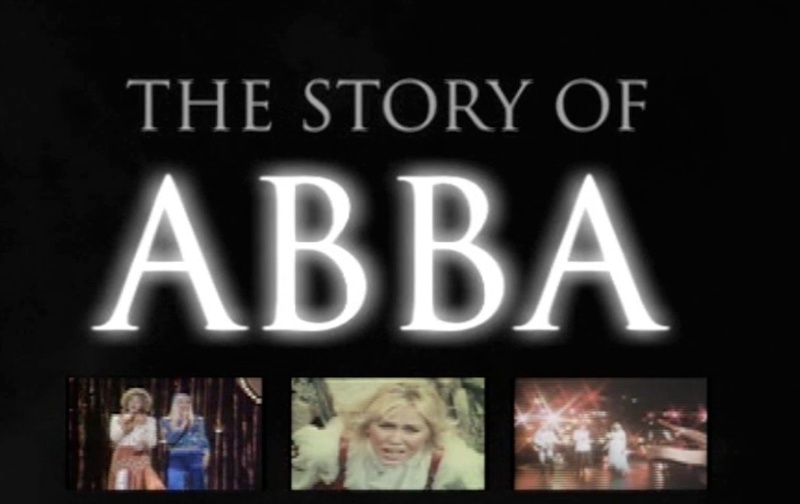 It explores where the four members of the group came from, the formation and success of ABBA and the post ABBA years. It features ABBA’s first major international live performance and Sweden’s first win at the Eurovision Song contest in 1974, their highly acclaimed concert tours including the Australian tour in 1977, and the impact of their music that has inspired several hit movies and a stage show – Muriel’s Wedding, Priscilla Queen of the Desert and Mamma Mia. On display are more than 20 original costumes, the epitome of 70’s glam, live concert footage, promotional and behind-the-scenes photographs, album artworks and other ABBA memorabilia, as well as exclusive interviews with members Björn Ulvaeus, Benny Andersson, Anni-Frid Lyngstad and Agnetha Fältskog. The ABBA concert dressing room, the writing studio on Viggsö – an island in the Stockholm archipelago where many of ABBA’s songs were written, and ABBA’s recording studio Polar Studio in Stockholm where the group recorded its last two albums, are also recreated in the exhibition. Visitors can relive ABBA’s music and sing and dance their way through the exhibition using a series of interactives including perform on a stage with ABBA, dance in an ABBA video, record a sing-a-long with ABBA, or be photographed on an ABBA album cover. Admission: Adult 12, family 16. Comments : Comments Off on ABBAWORLD Sydney. This TV special was recorded in November 1982 in Stockholm for Dutch TV channel “Veronica”. Exclusive interview with Björn, Benny, Agnetha and Frida talking about their lives as musicians and how everything started. Stikkan Anderson was also interviewed. The interview is mixed with videos from the solo years to 1982 as well as excerpts from the tours in 1977 and 1979. First aired on December 12th 1982. Super Trouper Deluxe Edition, The Official ABBA Site has now announced the track list for the 2-disc set. The original album and the bonus tracks have been remastered especially for this release, sounding better than ever. As for the bonus tracks, an exciting discovery was the stereo mix of the original, full length version of On And On And On, previously only available in mono. 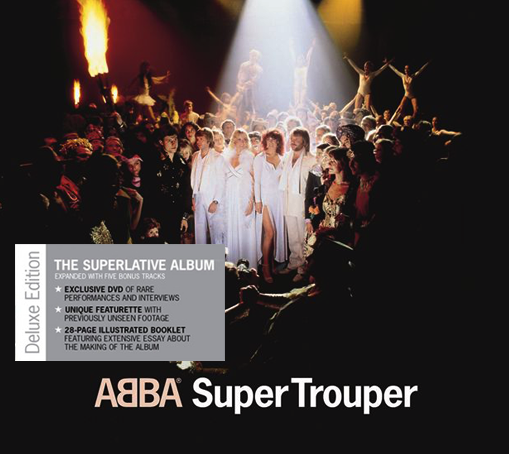 We are very happy to be able to include it on this Deluxe Edition of Super Trouper. The DVD contains a number of television performances of tracks from the Super Trouper album, none of which have been released on DVD before. The same goes for the vintage documentary Words And Music, produced by Polar Music International, which features the group talking specifically about the Super Trouper album in the immediate aftermath of the album’s completion. We are especially thrilled to be able to include a brand new featurette, entitled Somewhere In The Crowd There’s You – On Location With ABBA. 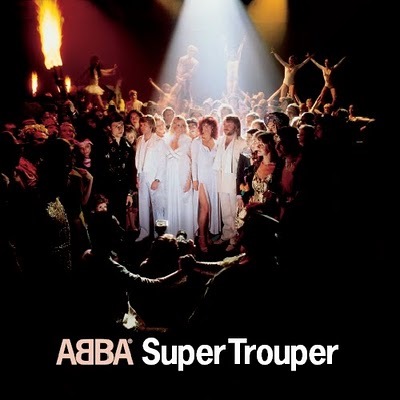 This featurette is a brand new production, compiling footage that was shot on the night when ABBA and their album designer, Rune Söderqvist, assembled a crowd of friends and circus performers to create the spectacular photograph featured on the Super Trouper album sleeve. This archive footage has been gathering dust in the archives for three decades without ever being made public – until now. As a bonus, we have included the original promo clips for ‘Super Trouper’ and ‘Happy New Year’ – both of which feature footage shot on the “album sleeve night” – to give the viewer further glimpses of what took place that night. The sequences included in the promo clips, shot by director Lasse Hallström, are completely different to the footage in the featurette, filmed by a separate film crew. The promo clips are the newly restored and remastered versions, out of which only ‘Super Trouper’ has been released before (on last year’s ABBA Gold CD/DVD Special Edition); the restored ‘Happy New Year’ is seen for the first time.